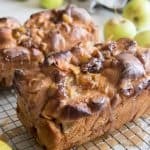 Apple Fritter Yeast Bread is soft, glazed apple & cinnamon sweet bread that tastes just like a sliceable apple fritter, except it gets baked in the oven in a bread pan instead of deep fried! It's one of our favorite things that we look forward to each Fall when apple season begins. Prepare the dough by first heating the milk in a small saucepan until hot and bubbles appear around the edges of the pan, but do not bring to a boil. Add the butter to the hot milk and stir until completely melted, then allow to cool slightly. In a large bowl, combine the flour, yeast, brown sugar and salt and mix well. Add the apple cider or water, beaten egg, and the warm milk/butter mixture. Stir until the dough forms into a ball and then knead for five minutes, until smooth. This can be done in a stand mixer using a dough hook. Transfer the dough to a clean, oiled bowl and cover with plastic wrap. All to rise until doubled, about 1 hour. While the dough is rising, prepare the apple filling by combining the diced apples, brown sugar, butter, lemon juice, vanilla, cinnamon and cornstarch in a large skillet and cooking over medium heat, stirring occasionally, until the apples soften and release their juices. The juices will thicken slightly from the cornstarch, but it will still be very syrupy. Remove from heat and allow to cool while the dough rises. Prepare 2 large bread pans with a parchment paper sling. Divide the dough into two equal-sized portions. On a very clean, lightly floured surface, roll out one portion of dough into a rectangle. Evenly spread have of the apple filling mixture, including juices, over the dough. Roll the dough starting from the long edge, cinnamon-roll style. Don't worry about the syrup leaking out too much as you roll. Using a bench scraper or sharp knife, cut the loaf diagonally in 1-inch slices, then change your angle and cut again in the other direction, creating an "X" pattern and slicing the rolled dough into small chunks. Scoop the chunks of dough and apple filling into the prepared bread pan, using the bench scraper to scoop up and add any spilled syrup into the pan. This part gets messy but it's the best way I've found to make sure there is even distribution of apples and syrup throughout the bread loaf. Repeat with the remaining bread dough and apple filling, then cover the loaves lightly with plastic wrap and let rise for 30 minutes. Heat oven to 350 degrees. Bake loaves for 35-45 minutes, until brown on top and cooked through. When done, immediately remove the loafs of bread from the pans and place on wire racks. Prepare the glaze by whisking together the powdered sugar, butter, vanilla and apple cider or milk in a bowl. Drizzle over the top of both loaves of warm bread and allow to set before slicing. Apple juice may be substituted for apple cider, although I prefer the stronger, more concentrated flavor of apple cider. Adapted from Flour Me With Love.